Posted on Mon, Nov 28, 2011 : 12:39 p.m.
Urban Meyer is headed to Ohio State, but Kyle Kalis says he's at least one recruit not tempted to switch his commitment from Michigan. Kyle Kalis sent shock waves through Ohio State and its fanbase when he decommitted from the Buckeyes last summer and verbally committed to play for the Michigan football team. The five-star offensive lineman made the move in the aftermath of a memorabilia-for-gifts scandal that cost former coach Jim Tressel his job and forced quarterback Terrelle Pryor to the NFL. Now that Ohio State reportedly is set to hire coaching superstar Urban Meyer later today, providing stability in Columbus, does that affect his commitment to the Wolverines? "Doesn't affect me at all," Kalis texted AnnArbor.com. Kalis, listed as 6-foot-5, 305 pounds by Rivals.com, is the Wolverines' prized offensive lineman recruit, and perhaps the biggest name in a class that ranks among the top five according to every major recruiting service. Already a five-star recruit according to Scout, Kalis picked up a fifth star from Rivals on Monday. He said he will begin his off-season training program today. He is working under the tutelage of former NFL great LeCharles Bentley. He also said he plans to play in the Army All-American Bowl. Kalis' commitment switch created a buzz in July, when ESPN quoted him as saying: "I believe the Michigan-Ohio border is now open. I think you're going to see eight or nine guys from the state of Ohio going over to Michigan this year." Michigan coach Brady Hoke's first class features nine players from Ohio, aided in part by the Buckeyes' scandal and cover-up. Kalis later told AnnArbor.com those quotes were misrepresented. Sat, Dec 17, 2011 : 12:31 a.m.
You can have the chump.Ohio St will have the number one recruiting class with out him .Take it to the bank. Tue, Nov 29, 2011 : 9:26 p.m.
Ok, so here's a question for the UM fans... Now that Hugye and Molk will be graduating, who do you see starting next year? Rocko Koury, at center? Does Schofield stay at guard, or move over to Hugye's tackle spot? If he moves, then who comes in at the guard spot? We've heard that Hoke thinks we are short of lineman....what, only 8?, so who's filling the backup spots next year? I'd be interested in your take. On the D-line we lose, Martin, VanBergen, and Heininger.....ouchhh! Can Campbell and Washington stand up? Will Roh, survive?, improve,? or is he likely to drop back down the depth chart? Again, what's your take? Tue, Nov 29, 2011 : 9:12 p.m. So, OSU, you seriously want to have a discussion about ethics? Seriously? That's amusing. On the one hand, we have an institution being run by a bunch of ethically challenged trailer trash (that's OSU just in case that wasn't clear) and on the other we have an 18 year old kid. You know what, in this case, the kid wins, hands down. Seriously. BTW, I don't see 64 people agreeing. Nice strawman though. He's a real catch. Huge, athletic, good feet- best o line recruit since Long. The O line will get only better next year despite the loss of Molk. Gotta believe Kalis will start as a freshman. Just wish we had a monster recruit like Kalis on the D line. Tue, Nov 29, 2011 : 3:52 p.m.
NONE of you answered my original post... How does Kalis' behavior (going back on his word, quitting in the face of disfficulty) express the character traits of a &quot;Michigan Man?&quot; This was GoBlue1984's original point and 62 of you agreed. Apparently, this concept of a &quot;Michigan Man&quot; is pretty shallow. Tue, Nov 29, 2011 : 2:59 a.m.
rightmind250 The way I see it if I was a recruit and Urban Meyer walked into the room, I would wonder if this was the Urban that proclaimed he was a gator for life and no other job interested him, or is it the Urban that once proclaimed that ND was his dream job, or is it the Urban that took the OSU job, that he also says is his dream job. If I was a recruit I would be somewhat confused by this &quot;God&quot; If I was a recruit and Brady Hoke walked into the room, I would say, here is a guy that has proclaimed forever that his ultimate goal in coaching was to be the &quot;head coach&quot; at Michigan. He felt strongly enough about this to tell his future employer at SDSU that exact thing when he asked him about his goals in coaching. I would see a guy that everyone that has played or coached with him has said what an honest and outstanding person he is. I would see a guy that got Greg Mattison to leave a DC job in the NFL to come back to Michigan to coach, teach and mentor young men. You my friend have a misguided outlook on what &quot;God&quot; looks like. Tue, Nov 29, 2011 : 3:16 p.m.
tzgoblue. Well said! Urban will have difficulty convincing a kid, that he really cares about that kid. Urban just doesn't have any sincereity to him. And the kids can see that. They know he'll throw them under the bus, when things head south. Mon, Nov 28, 2011 : 11:07 p.m.
Three point (to keep Blue fans in check) 1) Kalis &quot;decommits&quot; (a word only the NCAA could invent) from OSU. GoBlue1984 defines that action as typifiying a &quot;Michigan Man.&quot; 39 other people agree. Specifically, what trait does Michigan find so appealing? The fact he reneged on his word or the fact he quit when the going got tough? 2) What did OSU and Meyer do wrong? Both parties said nothing until after the season was over. The circus atmosphere was generated by the media (not OSU, not Meyer) trying to scoop a story when the event hadn't yet happened. Blame the party responsible -- the media. 3) Fickell knew and accepted the situation going into the season. Hence, the term &quot;interim coach&quot; and the statement by OSU that a permanent successor to Tressel would be named after the season. Fickell will do fine. These events advanced his career. Although he can have his old job back, he more likely will get a head coaching job earlier than he normally would. Managing a major program like OSU and handling the media through a crisis will make him a contender at Illinois, Kansas or (soon) UCLA. The Boren decision was actually a family decision. His father wanted Michigan to sign Zack they said no, tressel said yes, he transferred. Kalis said he didn't want to play for a team that was being penalized for something he was not part of. So, be it. In my opinion it's his loss. OSU will be NC's before he graduates. Michigan will be lucky to win a B10 championship. Tue, Nov 29, 2011 : 2:25 a.m.
To your first point, I ask you this: As an OSU fan, did you appreciate what Justin Boren did after actually PLAYING 2 YEARS for Michigan, then transferring to your school when, as you say, &quot;the going got tough&quot;? Worse, Boren actually WAS a Wolverine (and helped UM beat Meyer in the bowl game) when he, as you say, quit. Kalis, however, never played a down or even attended a practice for the Bucks...in other words he never truly was a Buck and therefore couldn't quit. Big difference between what Boren and Kalis did, so don't criticize Kalis especially when most Bucks welcomed 2 year Wolverine vet Boren with open arms. Tue, Nov 29, 2011 : 1:07 a.m. This opinion piece by Schlabach nails it. <a href="http://espn.go.com/college-football/story/_/id/7291138/former-florida-gators-coach-urban-meyer-short-term-solution-ohio-state-buckeyes" rel='nofollow'>http://espn.go.com/college-football/story/_/id/7291138/former-florida-gators-coach-urban-meyer-short-term-solution-ohio-state-buckeyes</a> Good luck with that train wreck! LOL!!! Mon, Nov 28, 2011 : 11:50 p.m. Points To Remember - urban meyer would not have been around for this kid for four years (sick, leave of absence, sick, retired, [repeat]. And urban, 0-3 against Michigan - looking for 0-4 next fall. (1) -- Fair points ... my defense would be they're just kids and not yet shaped and molded by the experience of either Michigan or Ohio State. (2) -- No complaints about OSU or Meyer ... on the whole I think it was handled relatively well. Keeping it bottled up much longer would have been impossible. Plus, we are in the heat of recruiting so obviously OSU and Meyer have to put the message out there. The way of things. Let's turn the page and prepare to do battle. (3) I do believe the &quot;interim&quot; title was removed earlier, wasn't it? Frankly, that's neither here nor there. I agree Fickell had to know his was not the first name they thought about. And that's why I think Fickell comported himself well through this ... his record aside for the moment. I agree he'll do well ... and in fact, I think I read that Meyer is planning to keep him on. Is that true? Mon, Nov 28, 2011 : 10:39 p.m.
Rivals has Kalis now a 5-star. There was a story up earlier about Bri'onte Dunn expressing lack of interest in running in a spread offense. Meyer has a two year window in which he has to prove he'll stick around. If after the 2014 season he hasn't vacated then the whispering campaign into skeptical recruits' ears will slow down. He left Florida with a weird aura around his head ... good coach, but brittle-in-the-head. Now Hoke on the other hand ... complete opposite. The man looks like the type of guy who knows what he knows and doesn't worry about the rest. He's comfortable in his skin. Did you catch this picture from the collection of pre-game shots: <a href="http://www.annarbor.com/calendar/photologue/photos/01%20UM%20OSU/cache/112611_SPT_UM_vs_OSU_MRM_110_display.jpg">http://www.annarbor.com/calendar/photologue/photos/01%20UM%20OSU/cache/112611_SPT_UM_vs_OSU_MRM_110_display.jpg</a> Hoke hugging Troy Woolfolk as Troy's parents look on. Do you see discomfort in Hoke's manner? None at all ... he's got Troy wrapped up in what is obviously a caring embrace for his senior. Now look at Mama Woolfolk's face. Seriously ... take a look. Now imagine mothers across Michigan and Ohio thinking about where to send their baby boy. Hoke has a big heart and isn't afraid to show it to players and their families. Now tell me again the recruiting wars are lost to Meyer. I ... don't ... think ... so. Tue, Nov 29, 2011 : 3:40 p.m.
@DonAZ Well said, as most of your posts are. I believe Coach Hoke and his band of merry assistants are going to thrive in the recruiting battles that will not only go on between that school in Ohio, but on a national level as well. When UM was in AA in August working for ESPN, he said that Coach Mattison was the best college recruiter he'd ever been associated with (Mattison sold Tebow on UF while working for UM). Coach Hoke and his crew will continue to work hard, pound the pavement, sell kids on the virtue of a Michigan education, and oh, by the way, play a little football at the best football program in America. Go Blue! Mon, Nov 28, 2011 : 10:31 p.m.
Why is this even a story? Michigan thumped Urban last time we played him and obviously this young man wanted an upgrade when he committed to Michigan. To even think some spread option wanna be at Ohio was going to sway such an obviously intelligent young man is beyond me. Ann Arbor dot com is apparently desperate for stories so they are making stuff up. The real story is why the heck would ANY smart young man want to go to that school in ohio? That my friends is the story. Mon, Nov 28, 2011 : 9:45 p.m. It's very likely Kalis won't be the only OSU de-commit. Not mentioning any names in this post, but stay tuned Michigan fans. Mon, Nov 28, 2011 : 8:58 p.m.
All I have to say is this..... WHAT a GREAT weekend ! To have finally vanquished the hated buckeyes on Saturday, it was fan TASTIC !! GO BLUE ! Mon, Nov 28, 2011 : 8:22 p.m.
Mon, Nov 28, 2011 : 8:17 p.m. I certainly hope Urban likes his time during probation at the tOSU. Hopefully, more recruits will consider this scenerio when recruited by tSU. Mon, Nov 28, 2011 : 7:27 p.m.
Kyle Kalis will have made the right decision. I hope he'll be able to recruit his Ohio buddies to come to Michigan. I like what some posters made about Urban Meyer bringing a lot of drama with him to OSU. Michigan has a very bright future. This was a transition year for the Maize and Blue and they still went 10 and 2. The 2012 schedule will be a lot tougher but Kyle Kalis probably saw the team spirit at Michigan. Surely, that and Coach Hoke's attitude kept him from reconsidering. He'll be an asset in protecting Denard in the O-line in 2012 because Mr Kalis is likely to action as a freshman. Mon, Nov 28, 2011 : 6:52 p.m.
First of all the stuff about Urban is still a rumor. Press conference is at 5:15 today to announce whats going on at ohio. Second, Urban Meyer is going to have some initial obstacles to overcome. Those are, a reduction in scholarships, a ban on all post season play, and a stigma of cheating if the NCAA hammers ohio. I think Urban will do just fine as a coach and recruiter but Michigan has done just fine with other great recruiters at ohio. Urban reminds me a lot of Nick Saban as a snake oil salesman. They are as low as low gets when it comes to loyalty and I think it will show the first 2 years for Urban if he is the next coach at ohio. Also, ESPN should be ashamed of itself this weekend for putting this rumor out there with no basis and making it overshadow the game itself! What a pathetic attempt to try and create news! As for Kyle Kalis. This is the type of situation that will continue to happen and has happened for as long as the rivalry has been going on. Remember, some of the best players to ever play at Michigan came from that state to the south of us! 1. Desmond Howard 2. Charles Woodson 3. Elvis Grbac 4. Mario Manningham 5. etc... Ohio is a football hotbed for recruits and Michigan will continue to get some of the best players from that state and every other state for that matter! It seems that Urban is also just the flavor of the week and I dont expect him to be at ohio for more than 4 years. He will get a chance to go to the NFL and will take it on the excuse that he does not feel good or that his family needs him. Mon, Nov 28, 2011 : 7:14 p.m.
chiro19 well said.. the rumor i heard that Urban Meyer would be anounced at the ohio vs Duke BB game Tuesday evening.. What I don't understand is that the NCAA has not come out with they're sanctions against ohio ,and would Meyer get to hold those extra 20 plus Bowl game practices ?? what a joke if you ask me..
Mon, Nov 28, 2011 : 6:48 p.m. 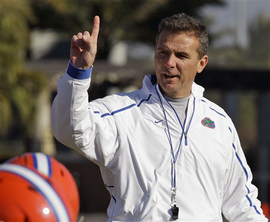 I like what SemperFi says about Urban Meyer: &quot;Hollywood Hire.&quot; Versus Brady Hoke? No contest: Meyer will arrive in Columbus with an air of &quot;doing a favor&quot; for TSiO. Brady Hoke, in his first press conference at Michigan said: Me and my family would have walked here (from San Diego) to take this job.&quot; So, right, Kyle Kalis knows what he's doing and knows it's not only the right thing for him but the classy thing as well. Recruiting Styles Compared: &quot;Come to Ohio and we'll give you some gifts.&quot; &quot;Come to Michigan because: This is Michigan.&quot; Welcome Kyle, you are in for a great life experience here. Mon, Nov 28, 2011 : 6:43 p.m. I don't blame OSU for looking to Urban Meyer, but what sticks in my craw is that during the Michigan Nebraska game, Meyer was the third guy in the TV broadcast booth. The play by play guy asked him outright if the &quot;rumors&quot; about OSU courting him was true. He flatly denied it. I am aware that such dealing are attempted to be kept quiet, but after OSU embarrassed itself with unethical violations, I would expect nothing but walking on eggshell behavior, including no lies by its coaching staff or potential new hires. I guess they have not learned anything from the Tressell scandals and should we expect that type of behavior to be standard OSU policy? I would rather they told him to simply say &quot;no comment&quot; rather than lie or be misleading. I think Coach Fickell was likely told at the beginning of the season his tenure would be temporary. Meyer does not faze me at all. Last time Michigan played him was that 2008 Capital One bowl game where Michigan beat him and his Heisman trophy winner. Mon, Nov 28, 2011 : 8:14 p.m.
Well, everyone knows one negative about Meyer; he doesn't tell the TRUTH. I say, &quot;Bring him on&quot;. Mon, Nov 28, 2011 : 7:19 p.m.
To be fair, the question was something like &quot;It's being reported that you have agreed to become the next head coach at Ohio State&quot; to which UM replied &quot;I've not been offered nor have I accepted the job&quot;. I'm paraphrasing but that's the jist of it. He was never asked if they were in discussions, nor did he say they were not. I'm not a fan of the way this all went down, but to say he lied is wrong. The way the question was phrased to begin with was the problem. Mon, Nov 28, 2011 : 6:58 p.m.
Its not just the broadcast with Urban, it is the preseason access he got from major colleges that is rediculous. He led them on that he was not looking to get back into coaching and I can promise you that if teams knew he was going to be the coach at ohio they would not have let him on their campus! I think that Urban can be successful because he has a defense to back his bad offensive style in the big ten. ohio will not be much better next year than this year wait and see! Mon, Nov 28, 2011 : 6:22 p.m.
wise choice Mister Kalis. Most of the quality kids will not be deceived by a &quot;Hollywood &quot; hire like Urban Meyer. These recruits love to interact with Brady Hoke and immediately feel the honesty and genuine interest he shows in them as individuals. Michigan will attract top players from around the nation with Hoke at the helm for years to come. Meyer will have his hands full trying to recruit top talent to OSU if they're put on probation and the folks in Columbus won't be very patient with less than 8 wins per year. Sun, Jan 22, 2012 : 7:21 a.m. Isn't winning on the field really all that counts? Thu, Jan 19, 2012 : 11:22 p.m.
How is that &quot;Hollywood&quot; hiring doing? OH YEAH...looks like Meyer and his #3 ranked class is &quot;having there hands full&quot; Wait, did I say # 3 ranked? Isn't that ranked high than Michigan? I been telling Michigan fans since Urban was hired, Coach Tress shut the door on Michigan for top rated Ohio recruits, and now Meyer will completely seal that door shut!!! This year being the only exception for the next decade AGAIN!! Mon, Nov 28, 2011 : 6:17 p.m.
Great that Mr. Kalis is not swayed to the dark side of things,and is standing behind his commitment to the University of Michigan..He too has realized where a Brady Hoke team is headed,after the fine season the Wolverines have had to this point. Heard on sports radio this morning,that Tressel gave the ohio team a pre-game speech !! Now thats arrogance in its true form !! Just over look everything I've done(lies,decite,money under the table,etc etc) and go out there and beat Michigan for me !! Didn't work out so well for the olde cheater vest.. Congrats Kyle Kalis for your choice is a great University.. TiM GO BLUE..
Tressel was in the locker room Saturday? That won't sit well with NCAA, or at least it shouldn't. The disassociation of the individual(s) is a pretty big part of getting back into compliance. Just look at the recent events in Miami and our own Fab Five debacle as examples. Mon, Nov 28, 2011 : 6:04 p.m.
Why can't UM get a coach of this calibur if it is an &quot;elite&quot; program? OSU is clearly superior to UM and wolverine football is clearly a thing of the past! Tue, Nov 29, 2011 : 12:58 a.m. Hilarious! Good luck with that freak show in C-Bus! It's a dumpster fire right now and you just hired a guy carrying a can of gas. Mon, Nov 28, 2011 : 11:47 p.m.
Hellooooo. Michigan already has a coach of this caliber, Brady Hoke 1-0 against the osu. BTW - urban meyer, 0-3 against Michigan, gunning for 0-4 next year ! Mon, Nov 28, 2011 : 10:11 p.m. I must be crazy in responding but all great coaching is made, not bought. All great coaches have to start somewhere. Brady Hoke may be a late bloomer but he did get Ball State going and gave SDSU a great season in 2010. What the heck; is a 10 and 2 record in a transition not off to a great start? Good luck with your expectations. Mon, Nov 28, 2011 : 7:06 p.m.
Michigan coach Brady Hoke became the program's first coach to win 10 games in his debut season since Fielding H. Yost in 1901. enough said..
Mon, Nov 28, 2011 : 6:37 p.m.
rnich231 Coach Hoke may be on his way to becoming an elite coach Meyer wasn't a big name until he won at Florida. Michigan football is on it's way back to the top of the big ten. Mon, Nov 28, 2011 : 6:27 p.m.
Oh yeah, everything is rosey in columbus. hehehe Its been 370 days since ohio last beat Michigan. Mon, Nov 28, 2011 : 6:21 p.m.
michigan does have a man for this elite. his name is brady. the clock is set at zero. let all the bashing come out next year on the football field. you got two new and good coaches. let them fight it out next november where it should be on the FIELD!. Mon, Nov 28, 2011 : 6:12 p.m.
Mon, Nov 28, 2011 : 5:49 p.m.
Now that's a Michigan Man!